In League of Legends and in most freemium games, skins are cosmetic changes that cost real money and have purely no effect on gameplay. They’re pretty much just for the players who want to look at something different when they play, and generally considered as bragging rights. But this new Blitzcrank skin is different: it tells people you’ve done at least a small part in helping out our friends in Visayas after the #YolandaPH typhoon. Why? Because Garena PH have decided that all proceeds that come from this limited edition skin will go to Sagip Kapamilya – Operation Yolanda. 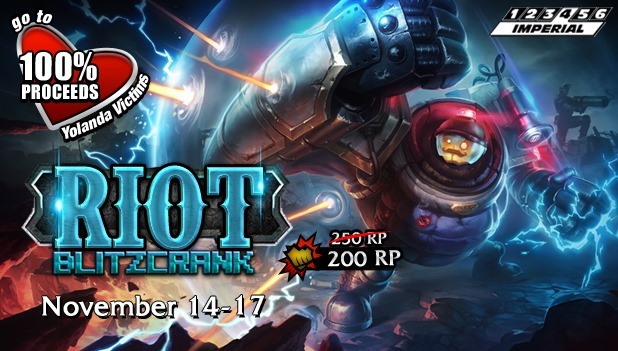 The Riot Blitzcrank skin is only available until November 17, 2013. So pick one up for “free” (with donation) today. If you haven’t started playing League of Legends yet, you can learn more about it here. You can find us with the in-game name “theTechnoclast,” probably running around with this skin.